National Opposite Day, an unofficial holiday, is a day to have fun all day long saying exactly opposite of what you really mean. This day has kids rejoicing everywhere. It is also a great day for adults to play along and break out of the winter blues. Maybe we should have dinner for breakfast and breakfast for dinner! 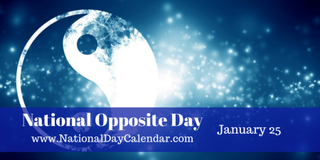 Most sources say that National Opposite Day is always observed on January25th while other sources say it is celebrated by some on January 7th. It is also believed to be celebrated by a group of people on the 25th of each month of the year. The origin of National Opposite Day is unknown however there are references dating back to President Calvin Coolidge in the 1920′s. In the 1928 election, Coolidge made a statement to the press announcing, "I do not choose to run". That statement spurned a debate and left everyone wondering if he really meant the opposite. National Irish Coffee Day is celebrated annually on January 25th. According to Wikipedia, Irish coffee (Irish: caife Gaelach) is a cocktail consisting of hot coffee, Irish whiskey, and sugar (some recipes specify that brown sugar should be used, stirred, and topped with thick cream. The coffee is drunk through the cream. The original recipe explicitly uses cream that has not been whipped, although drinks made with whipped cream are often sold as "Irish coffee". Many pubs offer specials or discounts for National Irish Coffee Day. Of course, you can also create you own at home.